Robert Gray became the first United States citizen to circumnavigate the world. He sailed from Boston in September 1787 and traded with the Northwest Coast Indians. He traveled to China before returning to the United States. First United States patent law was formalized in 1790. Last year alone the United States Patent Office issued almost 187,000 patents. Children could visit the very interesting Patent Office website at: http://www.uspto.gov/kids/. 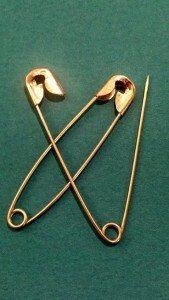 Speaking of patents…the safety pin was patented by Walter Hunt in 1849. He received patent number 6,281. Children can examine his patent at: http://www.google.com/patents/US6281. David A. Adler (born New York, New York, 1947) is an award-winning children’s author. He has written over 205 books. One of his books is Lou Gehrig, the Luckiest Man. He also writes the Cam Jansen series. Children can visit his website at: David A. Adler. Button Guinnett (born Gloustershire, England, 1735; died Savannah, Georgia, May 19, 1777) signed the Declaration of Independence. After he moved to Georgia in 1765, he prospered at farming. He became active in politics. However, he was killed in a duel. The British seized his plantation, and his wife and daughter died soon after. Eric Oswald Mowbray Knight (born England, 1897; died in airplane crash while in the military during World War II, January 15, 1943) was an author. He and his wife moved to Bucks County, Pennsylvania, where he wrote Lassie Come-Home. Children can learn more at: Knight. Clare Turlay Newberry (born Enterprise, Oregon, 1903; died San Diego, California, February 12, 1970) wrote and illustrated books for children. She earned four Caldecott Honor Awards: in 1939 for Barkis, in 1941 for April’s Kittens, in 1943 for Marshmallow. and in 1951 for T-Bone the Babysitter. Almost all her books were about cats. Children can learn more at: Cats. Children can also learn more at: Clare Turlay Newberry. Richard Peck (born Decatur, Illinois, 1934) has written more than thirty books for children. A Long Way from Chicago was a 1999 Newbery Honor Book. A Year Down Under won the 2001 Newbery Medal. 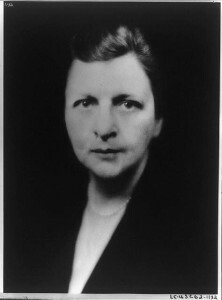 Frances Perkins (born Boston, Massachusetts, 1880; died New York, New York, May 14, 1965) was the first woman cabinet member, serving as Secretary of Labor for Franklin Delano Roosevelt from 1933 to 1945. Commodore Matthew Calbraith Perry (born Newport, Rhode Island, 1794; died New York, New York, March 4, 1858) was the American officer who peacefully negotiated with the Japanese to open its harbors to world trade. He sailed into Tokyo Bay in July 1853. By combining diplomacy with a show of military power, he gained the trust of the Japanese. This agreement made Japan a world power by 1900. Joseph Pulitzer (born Budapest, Hungary, 1847; died Charleston, South Carolina, October 29, 1911) was a journalist and newspaper owner. He came to the United States to fight in the Civil War. After the war he was a reporter for a Saint Louis newspaper. Later he became a part owner in the newspaper. For a while he served in the House of Representatives. He bought several newspapers and continued to be active in politics. His will provided money for the Pulitzer Prizes, including the areas of journalism, literature, drama, music, and public service. Idea: The Pulitzer Prizes have no special category for juvenile literature. Children could create their own prizes for their favorite books. Martin Waddell (born Belfast, Northern Ireland, 1941) writes books for children. He received the Hans Christian Andersen Award in 2004 for his body of works. His works include the Little Bear books and the Mimi Mouse books.